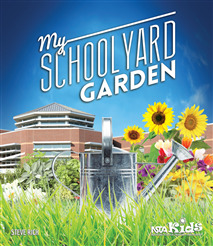 This colorful book takes students on a ramble through a school yard garden—past the seeding beds, along the compost bin, and over to the bird house and bird bath. Along the way, children learn what insects, animals, and plants need to thrive and discover the fun of observing and recording it all. My Schoolyard Garden proves you can learn a lot from a garden, no matter where it grows. This book caught my eye with its stunning photographs illustrating the relationships between plants in a school garden and the animal life it supports. There are many “how to” books on the market that provide information about the logistics of gardening, but this book is unique in its approach to teaching students K–3 about the interdependent relationships in ecosystems. ... I am very glad to recommend this book for teachers to read aloud to the whole class and for students to enjoy individually or in pairs to develop many different concepts of life science. The text and corresponding photos in this book provide interesting facts about ecology, recycling and decomposition, requirements of living things, food chains and webs, life cycles, and nutrition. I especially appreciate the author’s inclusion of social studies concepts. Students will learn about sharing their bountiful harvest with those less fortunate, the colonists' first gardens and creative use of plants for food as well as medicine, and the “three sisters”—bean, corn, and squash—in the tradition of the Native American people.